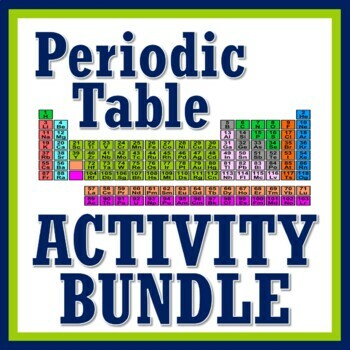 Save big when you bundle our most popular periodic table activities! Inquiry-Based Introductory Investigation OR Review: TWO VERSIONS! 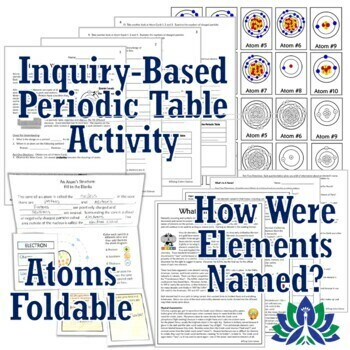 Use as an inquiry-based introduction OR a review activity of how to read the Periodic Table. Students are given 10 cards with atom drawings on them and must identify similarities and differences between the atoms. They are given 10 boxes from the periodic table that match each of the 10 atom drawings and must try to figure out which atom drawing matches with which periodic table box. Both versions (introduction or review) include several analysis questions and a Claims-Evidence-Reasoning grid related to which parts of the periodic table relate to which parts of the atom. Finally, students use what they have learned about how to read the periodic table to draw an atom. Both versions cover the following topics: atomic number, atomic mass, protons, electrons, neutrons, the basics of energy levels, and the basics of charges on atoms. Periodic Table Practice: This is a print-and-go worksheet designed to help familiarize students with using the Periodic Table and get them finding information a little bit quicker. They practice finding the following information about SEVERAL different elements each: atomic number, atomic mass, symbol, name, number of protons, and number of neutrons. Students really get more fluent at using the table with this assignment! Familes of the Periodic Table Worksheet: Middle school students get a better understanding of the families of the periodic table, without over-complicating it. In Part One of this worksheet, students get a better understanding of characteristics of element families as they complete a grid with information such as group number, elements in the group, characteristics of the group, examples of this group in “the real world”, etc. They color code each family using colored pencils. In Part Two, students fill in a blank Periodic Table with element symbols, row number, and group numbers. The table is color coded with the same family colors as students used the first part to show related elements. Note: Students may need a textbook, the internet, or another resource to complete the worksheet. 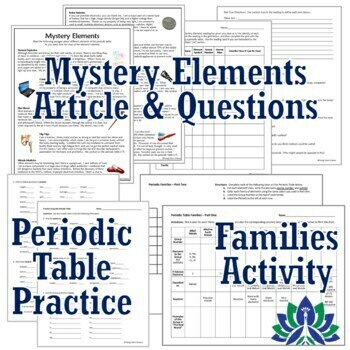 "Mystery Elements" Reading & Analysis: Students read clues about 10 mystery elements to find their identity, and in the process learn about interesting uses of each. First, students read about 10 elements and their interesting uses. They are given a small clue, such as their atomic number, to identify them. Then students identify each element and complete a 2-page analysis by using information from the text and by pulling additional information from a periodic table. Great as a sub plan! 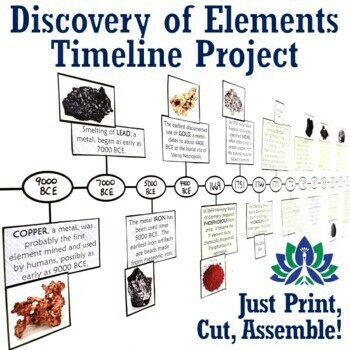 Discovery of Elements TIMELINE PROJECT: EASY - JUST PRINT, CUT, ASSEMBLE! Everything you need is included for students to create a Discovery of Elements timeline or bulletin board. Students find out when 25 elements were discovered, from BCE times through the present. Two versions are provided - Version One requires students to research 25 elements (prompts provided) and Version Two gives them 25 pre-made element information cards. The only supplies necessary are copier paper, glue and colored pencils. NO COLOR PRINTING IS REQUIRED! The pictures look better in color, but still print fine in black and white. The information boxes are colored by students with colored pencils. A variety of elements from BCE times through 2009 are included. We aimed to include elements with stories that are particularly interesting or monumental. Also includes the FREE Printable Periodic Table available in our store, for your convience. This is a crisp, clean, and easy to read printable version. The atomic masses have been rounded off to make it a little easier for a diverse group of students to use. or FUN Holiday Periodic Table Decoding Activities. Check out the Periodic Table Section of Our Store for much more! Search our no-frill NGSS-Aligned middle school materials in Our Store!